Poodles come in a lot of different sizes. The largest is the standard poodle, which weighs about 75 to 80 pounds. The next size down is the medium poodle, which is about 40 or 50 pounds, followed by miniature poodles which weigh 12 to 18 pounds, and finally toy poodles, which are a mere 10 inches high at the highest point of their head when standing. Because poodles do not shed they are excellent for people with allergies, but their curly hair can get tangled so they need to be groomed once a month. Poodles are a lot of fun to draw. The curly hair is just irresistible, especially if you are a cartoonist or an artist with any sense of humor. What's even better is that poodles are exceptionally smart -- they are second in line for smarts in the dog world, beaten out only by border collies, and one position ahead of german shepherds. With all those smarts, poodles can get into all sorts of peculiar habits, and learn terrific tricks. Poodles owners also tend to be a little quirky, too, and so that adds to all the ruckus. 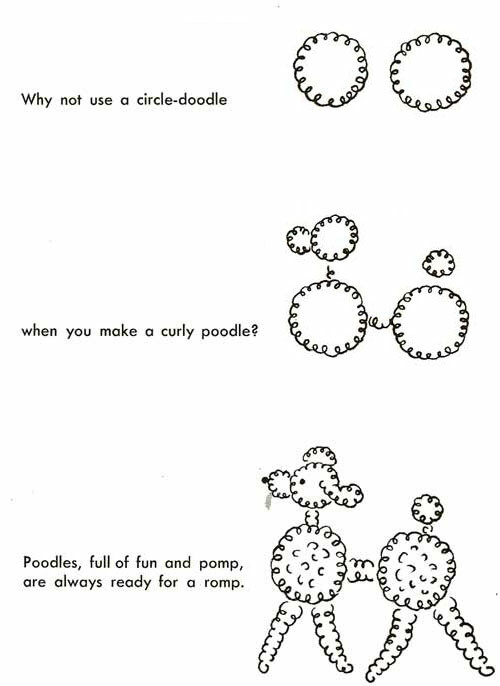 If you like circus themes, or off-beat hipster art, being able to draw a good poodle will serve you well.